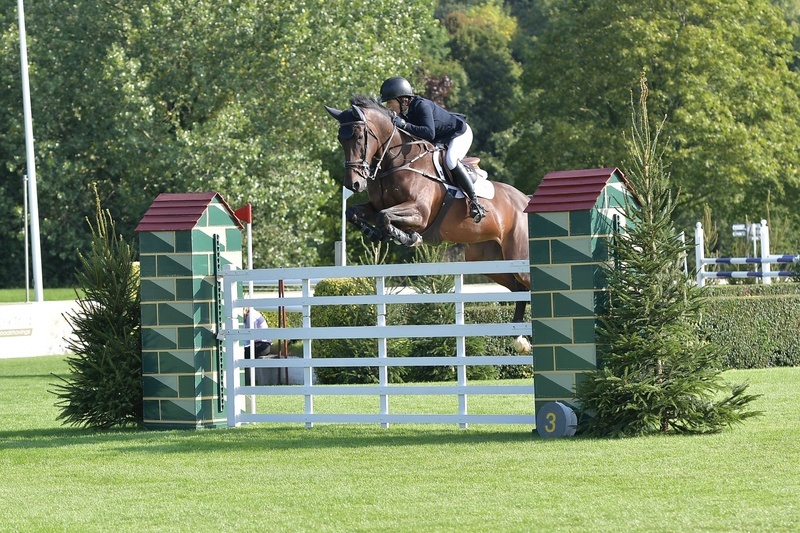 The All England Jumping Championships at Hickstead is the last chance of the summer to jump on grass in England. In theory everyone has a chance to qualify to jump in the main ring, but, as the show gains popularity every year, in practice you have between a 1 and 5% chance of actually achieving this, unless you can enter straight into a 1.40 which luckily is what I did on Emma. Although it is a four day show, I just jumped Thursday and Friday as we were at a wedding on Saturday and Sunday. Doonaveeragh Emma jumped a fabulous double clear in the 1.30 on Thursday setting her up nicely for the 1.40 on Friday. The ground was quite soft so I moved Luendi from the 1.30 6 year olds to the 1.10 on Thursday. She was rather fresh and strong, but super confident and then jumped a very good round in the 1.20 on Friday. The course for the 1.40 on Friday was definitely one of the biggest I have ever set out to jump and the main ring at Hickstead is undoubtedly a very daunting stage. The last round I jumped in the main ring was on Emma in the Five Year Olds and for the first time for ages I felt quite nervous setting out on the course. As we turned to the second fence Emma obviously looked down the line of fences and the enormous ring, she probably felt my nerves as well, and she completely dropped the bridle. This is very unnerving feeling when you are riding a horse who is normally very strong, and I never found any sort of distance which resulted in a stop. Very bravely she turned round and jumped straight over and continued to jump a very good round, just tapping the back of an oxer when I didn't have quite enough leg, and I got her a little bit close to the planks. I was hugely disappointed with myself, and there were some stern words about my riding. This was an opportunity to take Shane's advice on board, dust down my pride and practice keeping my leg on and using it more effectively on take-off. Emma jumped a fantastic round at Pyecombe the following weekend so hopefully her confidence hasn't taken any knocks. Luckily I had Steff Gibbs helping me at Hickstead. Good help makes all the difference, especially for jumping in the main ring as you can't watch from your horse. Little Lava hof ter Zeedycke (Katlin) has come back from her holiday at Hickstead looking like a bullock and is very much stronger now. This has resulted in a fair amount of teenager-like behaviour while she tries to push a few boundaries. However quiet patience and determination seem to be winning and I still think she is going to be very special. She feels much stronger in her jump now and doesn't get tired so quickly. We are nearly ready for a little schooling trip to Felbridge but she is a little bit of a busy character so I am taking things very steadily with her. The September show at Hickstead seems to mark the end of the summer season as probably the last big outdoor show on grass. We had an intense training session with Shane at the beginning of the week. The five year olds definitely don't improve with 9 days off, and although I had a good show in Auvers, jumping competitively for six days necessitates putting all the buttons back in place with some serious training. It was very Autumny getting the horses ready in the dark on Thursday morning. The show started with Doonaveeragh Emma in the 1.30 warm-up. She jumped really well, but I had her too far off the double in the jump-off and she had four faults. She then jumped in the 1.35 7 Year Old Championship where she jumped very well apart from running out at the second fence in the jump-off. This confirmed that I hadn't really got her back to where she was before we went to Auvers. When she ran out again on Friday, Shane advised me to give her a good school round the 1.10 before jumping her in the 1.30 on Saturday. Hopefully mission accomplished as she jumped really well, and allowing me to make the decisions in the 1.30. She just had the last fence in the first round when I got her too close, but at least it was my wrong decision rather than hers! Having a bit more control means we need to make a few adjustments to our partnership, but it feels a lot less chaotic now! Espirito Santo had been very green in schooling so I was a little bit apprehensive of how he would jump a 1.15 Five Year Old class which was his biggest challenge yet. He was a little star, just having the water-tray in the jump-off. He jumped well all week and feels like a fabulous prospect for the future. Espirito Santo - 5 year old championship. Creevagh Doonaveeragh had also had a less than brilliant schooling session at the beginning of the week, so I was thrilled when he jumped very well in his 1.00m classes. He is an unbelievably bold, well behaved and well balanced horse, and as he gets better in his ride he is going to jump some really super rounds. My plan is to try and take him hunting as well as jumping him through the winter. Many thanks to Jemma Tester and Becky Forte for their help which made the show so much easier for me. Excitingly for me, Luendi, who suffered a minor injury in April, is now back in work and should be ready to jump in a couple of weeks. I have loved riding her from the first week that she was broken, and she has grown and matured in her time off and feels absolutely great to ride, so I cannot wait to have her back in the ring.